rif was at the office (shocking, as he’s always at the client’s place) today and felt like having roast duck for lunch. So Dan and I met up with him in front of his office before heading to The Champion Duck nearby. When we got there, the place was already packed with people. We ordered half a duck (RM 22), 2 rice (RM 1 each) and a bowl of curry pan mee (RM 4). 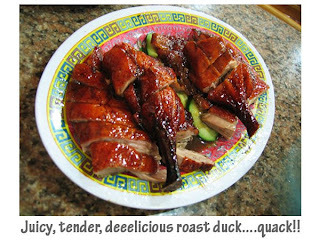 * Update as of 10/6/2008: Dan, rif and I went back for dinner and the duck has increased in price!! It’s now RM 24 for half a duck no thanks to the petrol increase. Crap… The duck was delicious as always. Roasted till golden brown, the skin was light and crispy. With just the right ratio of fat and meat, every bite was sheer delight. The meat was succulent, tender, well marinated and tasted good on its own. No sauce was necessary but the sauce provided tasted great with rice, which rif and Dan had 2 bowls each. My Curry Pan Mee was not bad. 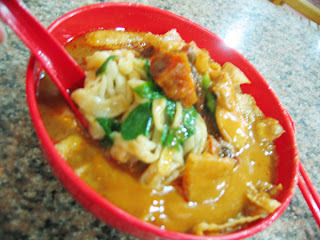 The hand-made noodles came generously topped with raw cockles, fish slices, fish balls, tau fu pok, pig skin and laden with curry broth. The curry broth was thick, spicy and full-bodied, just the way I like it. *Jeen, I don’t think I’ll be taking you to Sunrise. This place is much better! Verdict: My current favourite Roast Duck place. rif too. yes! very nice duck. top on my list of roast ducks in KL. but sadly no where near the duck in London. But almost your whole company was in the shop la! would you know where the pan mee seller has gone? miss his pan mee very much.